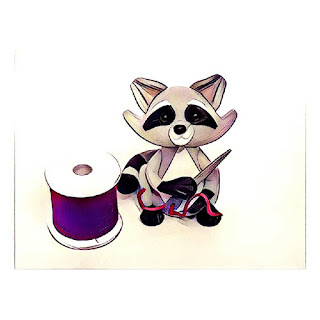 Raccoons Rags: New inventory in my Etsy shop. SIX outfits. New inventory in my Etsy shop. SIX outfits. Having had a blast re-creating SSP-039 to fit Kaye Wiggs and Iple KID, and having gotten COMPLETELY carried away and having fun... I now have six new outfits listed in my Etsy shop. In my Etsy shop in the "Handmade Doll Fashions" section. Click on the images to take you to their individual Etsy Sales pages. Here are the six lovely little outfits for Patience, mini Kaye Wiggs (14") And Iplehouse KID. First up is our ever-cheeky Patience. She's loving the laid back huckleberry feels, and really wishes Spring would pull its socks up and arrive. And for my cute Mini Layla, These ensembles: The first one will not fit Iplehouse KID. The second two will, but it is a very tight fit! And a couple for Iplehouse KID. these can be worn by Mini Kaye Wiggs, and are a baggier fit, but I quite like the bagginess. My personal favourites are the clown outfits. I'm not a huge fan of clowns, but done right, dolls can look adorable in little clown costumes. Lovely outfits. I do like the Patience outfit best (well I would!) The clown outfits are very cute and I'm not a fan of clowns either! I have made nothing for the dolls this year too busy with crocheting a blankie ....I really do need to make something for Ellowyne next (don't tell the tribe)! Crikey, you've been busy! I've only managed five outfits so far this year and one of them was half made anyway! I love the pant-leg mix. Wearing pants with different leg patterns has been my personal spleen for at least 30 years, I don't own a single pair of pants with two similar looking legs. Very cute pattern, great job!